Dr Yoav J. Tenembaum is a lecturer in the Diplomacy Studies Program of the School of Political Science, Government and International Affairs at Tel Aviv University. Hitler entering Prague Castle, 15 March, 1939. A turning point in the history of international relations refers to an event that alters significantly the present process in international relations, which entails a long-lasting, considerable effect in it. A turning point may not necessarily be the trigger to a significant change in international relations, but rather part of the underlying cause leading to it. The turning point in the history of international relations in the 1930s occurred in 1939. However, rather than the outbreak of World War II, in September of that year, it was the invasion of German troops to what remained of Czechoslovakia in March 1939, following the Munich Agreement of 1938, that represented that turning point. It was a significant landmark as it showed even to the most enthusiast supporters of the appeasement policy towards Nazi Germany that German ambitions went much beyond the supposed rectification of the wrongs done to Germany by the Versailles settlement of 1919, following World War I (or the Great War as it was then known). The appeasement policy pursued by Britain and France was founded on the premise that Germany was maltreated by the victors of World War I, and that German grievances had some justification and could be accommodated in order to prevent the outbreak of a major European war. Employing the rhetoric of the parliamentary democracies, Adolf Hitler and the Nazi regime argued that the German people had the right to collective self-determination. Consequently, the prohibition included in the Versailles settlement according to which Austria should remain a separate state and not be allowed to be part of a larger German state was deemed to be unjust. After all, shouldn’t the Austrian people ‘freely’ decide whether they wish to live in a separate sovereign entity or be incorporated into Germany? By the same token, and following the same logic, Germany argued that the German inhabitants of the Sudeten region in Czechoslovakia should have the right of self-determination. The fact that the area concerned was an integral part of the sovereign territory of Czechoslovakia (incidentally the only truly parliamentary democracy in Central and Eastern Europe) only enhanced the case put forward by Germany. The German population in the Sudeten region was being treated harshly by the government in Prague, claimed Hitler and the Nazi propaganda machine. Thus, the case for national self-determination was no less valid as regards the German minority in Czechoslovakia than it was in the case of Austria. The more Germany accused Czechoslovakia for the supposedly inhuman treatment of its Germany inhabitants, the more likely the prospect of a general European war was feared by Britain and France. Why risk such a war if applying the right of collective self-determination could actually avert it? Of course, Britain’s Prime Minister, Neville Chamberlain, thought of that conflict as “a quarrel in a far-away country between people of whom we know nothing.” He didn’t seem to be particularly concerned with the fate of the German minority in Czechoslovakia or, indeed, with their right of self-determination. His policy, though, was based on the assumption that German grievances in this matter were related to the supposed wrongs inflicted on Germany and the German people following World War I. To be sure, the real issue was not the quarrel to which Chamberlain referred to, but rather the ambitions of the Nazi regime. After all, even Chamberlain himself asked Hitler whether he had any further territorial demands, beyond the Sudeten region; to which the German leader replied in the negative. Indeed, Hitler stressed cynically, albeit in a rhetorical way, that he was not interested in adding Czechs and Slovaks to the German Reich. 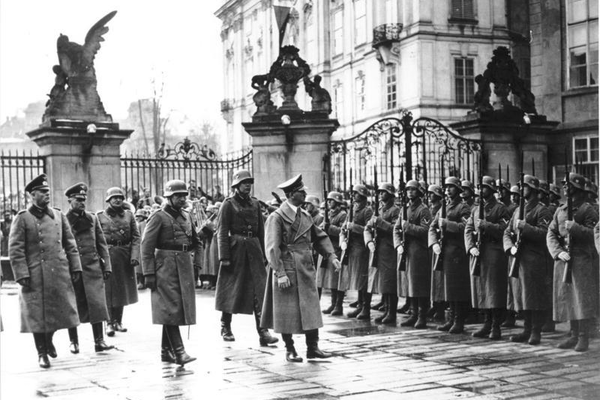 Once German troops entered Prague in March 1939, the whole conceptual edifice justifying German demands collapsed. There was no way anyone could logically justify the German move by resorting to the supposed evils imposed upon Germany by the Versailles settlement. The cherished principle of collective self-determination could apply now in reverse: it was the Czech people who were denied their right of self-determination. In a sense, it could be argued that the day German forces occupied Prague was the day that the anti-appeasers in Britain, led by Winston Churchill, turned from a cornered minority into a solid majority. It was also the watershed that altered once and for all the character of international relations in Europe: the time for pretense was over. The sense of remorse over the post-World War I settlement and the widely-acceptable principle of national self-determination could no longer justify any policy aimed at preventing war with Nazi Germany. March 1939 was the real turning point. September 1939 was to be the climax.